Blooms Landcare has been providing quality landscaping service in Benbrook, TX since 2006. Our degreed landscape professionals have knowledge and expertise in a variety of landscaping specialties, including landscape design, installation, commercial and residential landscape maintenance, irrigation, drainage, outdoor lighting, and outdoor living design. In fact, our dedicated team of Benbrook landscapers are ready and standing by to assist you with all your landscaping needs. Firstly, you should know that our Benbrook landscapers provide our customers with quality service at affordable rates that won’t break the bank. From the moment you call, we will exceed expectations. Therefore, let us know your landscaping needs, and we will give you a free estimate, along with an anticipated timeline. As always, you will know how much your landscape transformation will cost and the time it will take till you can enjoy your finished product. Benbrook, TX is a town in Tarrant County, located in the greater Fort Worth area. It has a population of roughly 24,000, based on 2010 estimates. 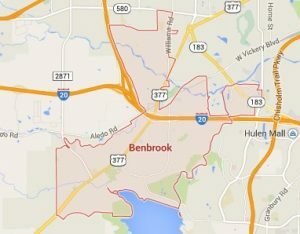 Benbrook is one of the oldest communities but also one of the youngest incorporated cities in Tarrant County. Blooms Landcare is proud to serve the great city of Benbrook with exceptional landscaping services. For more information about our landscaping service in Benbrook, contact the landscape professionals at Blooms Landcare. Call (817) 688-5352 or contact us online for your free landscaping quote.